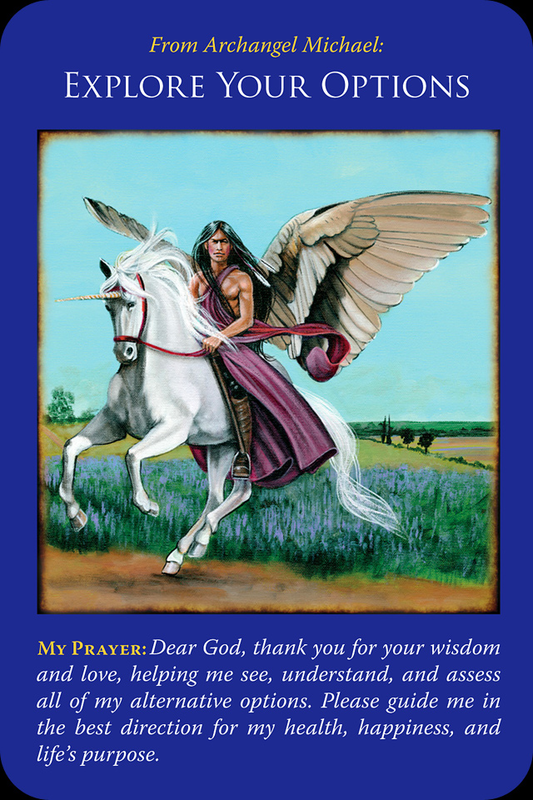 July 14, 2014 bcalvanocoachingLeave a Comment on Weekly Angel Card Reading for July 14 through 20. Weekly Angel Card Reading for July 14 through 20. Also join me at my new time on Wednesdays at 1pm EST at BlogTalk Radio. Listen live on your computer or phone or rebroadcast at Itunes or download. 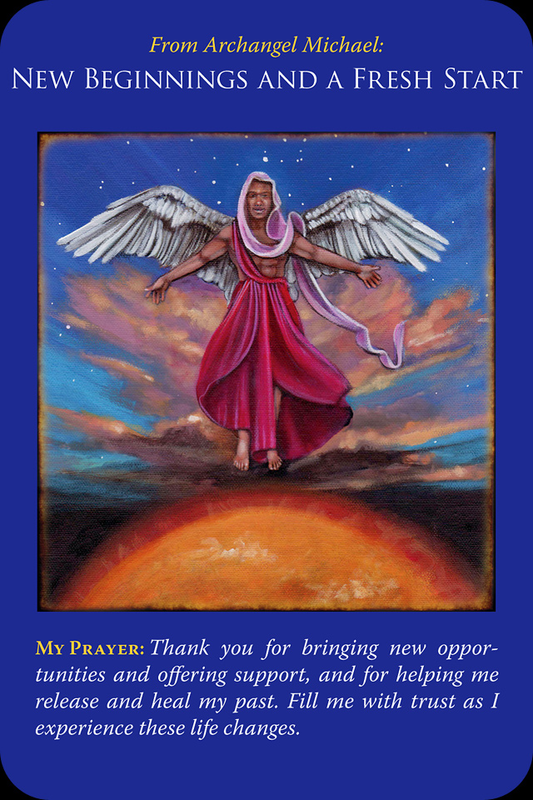 This week I am guided to use the Archangel Michael Oracle Cards by Doreen Virtue. For Monday and Tuesday we have the message, “Explore Your Options: Dear God, thank you for your wisdom and love, helping me see, understand, and assess all of my alternative options. Please guide me in the best direction for my health, happiness, and life’s purpose.” The angels remind us to remember, anything and everything is possible! Take notice and tell the truth of any situation in your life where you are unhappy, feeling stuck or that things are not moving as you would wish. It’s time to release and let go of people, places and things that no longer serve you. It may be time to change and let go of jobs, health routines, doctors, therapists, hair dressers, relationships, etc. We are reminded that we can have our lives be great and actually drama free. Whether it is with career, relationships, health or passions, take time to look and choose new available pathways that you are being guided towards! Now is the time! Prayer: Dear God, thank you for your wisdom and love, helping me see, understand, and assess all of my alternative options. Please guide me in the best direction for my health, happiness, and life’s purpose. A perfect message to follow the first. Continue to release the past! Let it go! It takes courage to change.There a wonderful book by Rollo May that I got years ago when I was deep in the artist life living in a loft back in the 70’s called, “The Courage to Create”. At the source of creativity is – courage! We each are like artists and have the full capacity to create our lives as we dream possible! Fear almost always shows up when we want make a change. In making changes we often release and heal this fear from the past. Archangel Michael can support and assist us in doing this. In any moment you can create a brand new fresh start in your life- in any area! Prayer: Thank you for bringing new opportunities and offering support, and helping me release and heal my past. Fill me with trust as I experience these life changes. 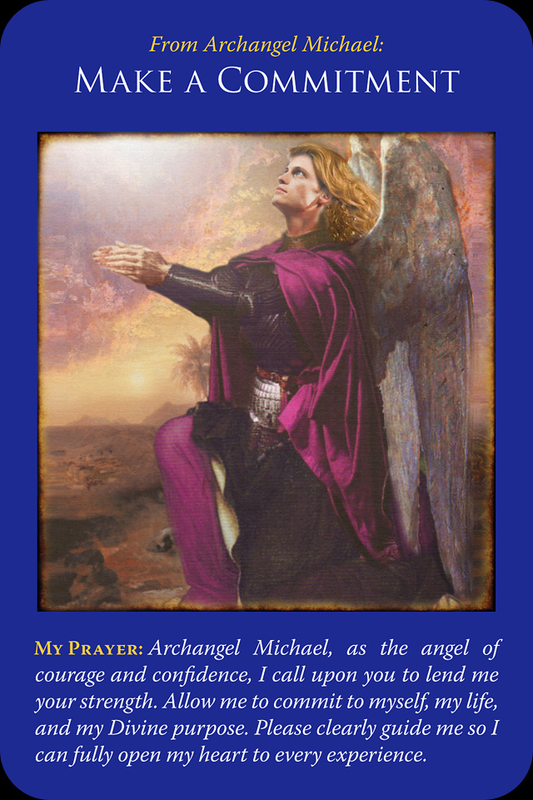 For the end of the week we the have the message, “Make a Commitment-Archangel Michael, is the angel of courage and confidence, I call upon you to lend me your strength. Allow me to commit to myself, my life, and my Divine purpose. Please clearly guide me so I can fully open my heart to every experience. “Archangel Michael and the the angels are with us as we choose to commit to our lives – lending us their courage and confidence. All of us, myself included can have doubt and uncertainty at times. We’re guided to go ahead and make that commitment. Open our hearts and take a risk! It requires being vulnerable whether it’s a new relationship, new job, learning a new skill, anywhere where we may fail or falter. Working closely with Archangel Michael taps us into the unconditional love and strength of God and the angels so that we can have more grace and ease and – fun! If we hesitate and act with doubt our outcome will reflect that choice. Fully commit and see your vision become a reality! Commit to being confident, present in every moment of your life. Remember it is practice not perfection while living your life! Prayer: Archangel Michael, as the angel of courage and confidence, I call upon you to lend me your strength. Allow me to commit to myself, my life, and my Divine purpose. Please clearly guide me so I can fully open my heart to every experience. This week we are guided to stop and take notice of all the options and opportunities that are available for us in any area of our lives, where we would like to see change or transformation. We have been given these ideas as messages and now it’s time to embrace a new start we would like to take. There will be a healing release of the past. By fully committing with courage and confidence we can assure ourselves of our desired outcome! Archangel Michael is the angel of courage, confidence and strength. Call upon him daily to support and assist you. Better yet, ask him to be by your side always and to come into your dreams at night to work with you on your requests! Upcoming Angel Card Reading/Coaching Events for July & August! Join my email list for my weekly angel oracle card readings and more! Previous Weekly Angel Card Reading for July 7 through 13.